This section describes the Edge installation topologies (i.e., the node configurations supported by Edge). * These configurations do not include the Apigee Developer Services portal (or simply, the portal). For more information, see Portal overview. For Apigee Edge for Private Cloud, please work with your Sales Rep or Account Executive to engage with Apigee Edge Professional Services and Customer Success to plan out any custom topology requirements. Performance varies by use case, so we recommend setting up a performance environment to analyze and tune your performance before rolling changes out to your production environment. A single node runs all Edge components. Apigee recommends this topology be used only for non-production or development installations, as this configuration is not optimal for performance. This topology should not be used for performance testing. This topology does not support high availability. For installation information, see All-in-one installation. 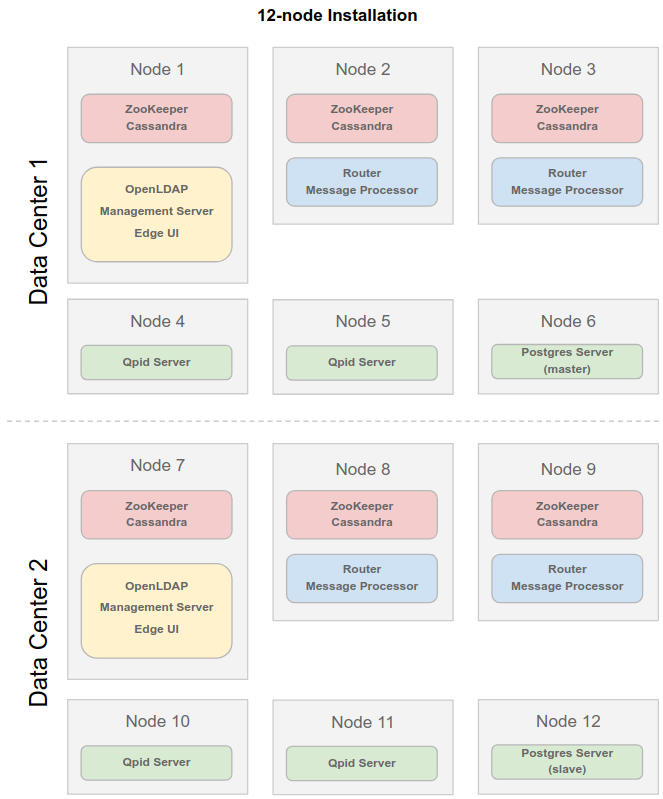 In this scenario, a single node runs Gateway standalone servers and associated components: Apigee Management Server, Apache ZooKeeper, Apache Cassandra, OpenLDAP, Edge UI, Apigee Router, and Apigee Message Processor. The other node runs Analytics standalone components: Qpid Server and Postgres Server. For installation information, see 2-node standalone installation. 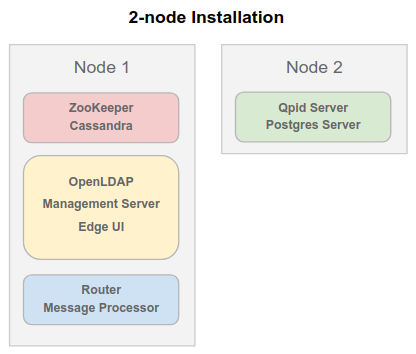 In a 5-node topology, three nodes run ZooKeeper and Cassandra clusters. One of those three nodes also runs the Apigee Management Server, OpenLDAP, and Edge UI. Two of those three nodes also run Apigee Router and Message Processor. Two nodes run Apigee Analytics. NOTE: This scenario combines cluster and Gateway components to reduce the number of servers used. To achieve optimal performance, the cluster can also be deployed on three different servers. This scenario also introduces a master-standby replication between two Postgres nodes if analytics statistics are mission critical. This topology limits the ability to scale the deployment for future expansion needs. Only Routers and Message Processors can be expanded easily in this topology, as described in Adding a Router or Message Processor node. 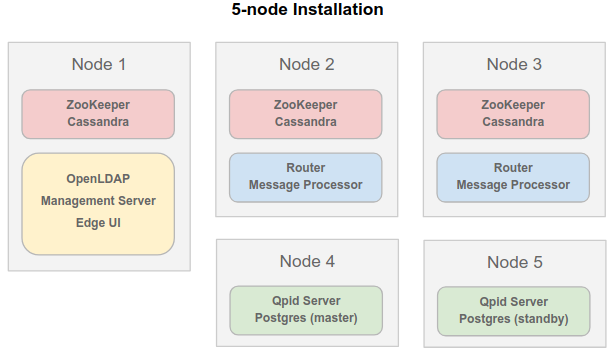 For installation information, see 5-node installation. This scenario is similar to 5-node clustered installation but has different Analytics components setup to achieve performance high availability. While this topology represents the minimum number of nodes for a production installation, it is not optimal for performance. You can expand this topology to support high availability across multiple data centers, as described in Adding a data center. In this topology, Routers and Message Processors are hosted on the same nodes and may result in “noisy neighbor” problems. This topology is limited to a 3-node Cassandra setup with a quorum of two. As a result, your ability to take a node out for maintenance is limited. 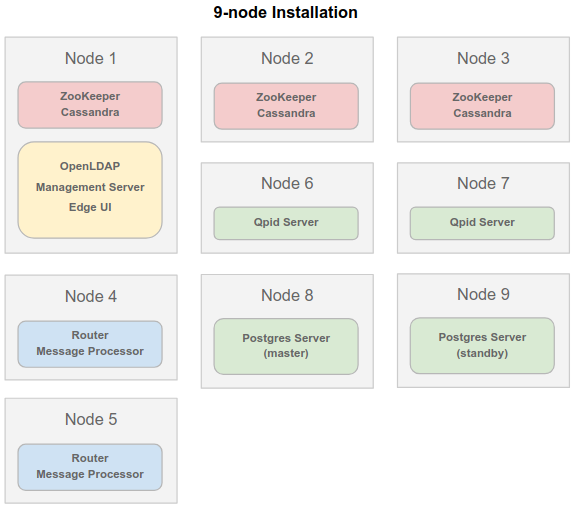 For installation information, see 9-node clustered installation. This scenario is an enhancement of 9-node clustered installation covering separate data zones for data and Apigee servers in one datacenter setup. Here LDAP is installed as an independent separate node. Apigee recommends this configuration as a minimum topology for production setups with the documented hardware specifications. For more information, see Hardware requirements. You can expand this topology to support high availability, as described in Adding a data center. 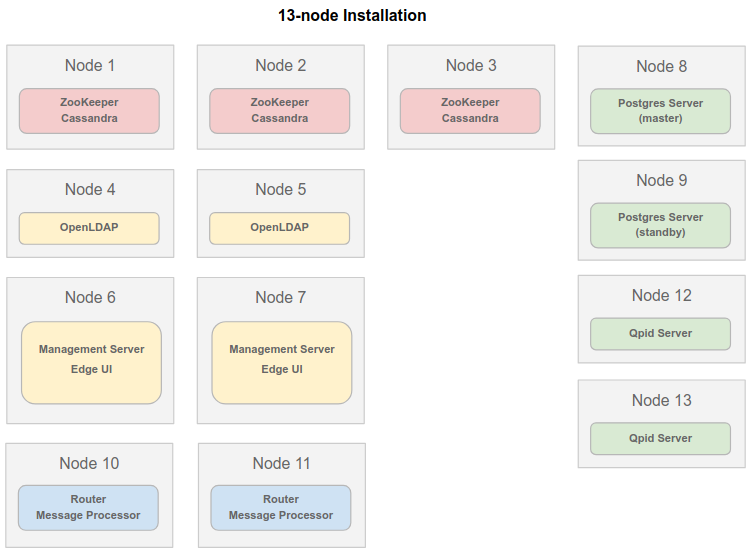 For installation information, see 13-node clustered installation. This scenario covers disaster recovery and analytics high availability across two data centers. NOTE: This scenario uses master-master OpenLDAP replication and master-standby Postgres replication (across two data centers). Apigee considers this topology adequate for production purposes. However, since every installation has its own unique requirements and challenges, please contact your Sales Rep or Account Executive to engage with Apigee Edge Professional Services and Customer Success. For installation information, see 12-node clustered installation. For more information, see Installing Monetization Services.